The facts of the case are related somewhat differently according to different authors, but the story is essentially the same. In his Lent sermons, St. Bernardino da Feltre, who inveighed against the Jewish money lenders, apparently insisted that the Jews would massacre a Christian child at Passover. Following the Jewish Encyclopedia and its sources, on March 23, the day after Passover, a Friday, the child Simon, aged 28 months disappeared, and was found dead on Easter Sunday (March 25)ref or March 26 by three Jews named Tobias, Samuel and Angelus (or only by Samuel, a merchant of Nuremberg, in another version). According to a Christian version, the child was killed on on March 21. The difference is significant, Passover was on March 22. If the murder took place on March 23, the blood could not possibly have been used to prepare Matzot. The entire Jewish community or a large part of it was arrested. They were tortured. Seventeen of the victims eventually "confessed," reportedly repeating the precise words of their torturers according to the Jewish Encyclopedia. Duke Sigmund and others interceded and halted the torture on April 21. The persecutions were nonetheless resumed on June 5. An 80 year old Jew named Moses likewise "confessed" and on or around June 21-23, eight of the wealthiest Jews were baptized and executed by burning at the stake or beheading. However, the Franciscan Pope Sixtus IV, alarmed for the reputation of the Church, commanded Bishop Hinderbach on August 3 to suspend proceedings, pending the arrival of the papal legate, Bishop Giambattista dei Sindici of Ventimiglia, who would conduct the investigation with the Bishop of Trent. 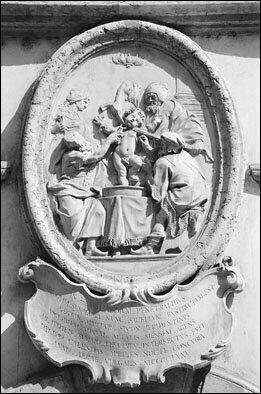 Upon investigation the Bishop of Ventimiglia denied the martyrdom of the child Simon and disputed the occurrence of a miracle at his grave. However when he demanded the immediate release of the remaining Jews, the papal legate was denounced by the bishop of Trent and mobbed. he was forced to flee to Roveredo. Obedient to the instructions of the Pope, the Papal legate summoned the podesta of Trent and Bishop Hinderbach. But Hinderbach did not appear, and instead issued a circular that described the supposed martyrdom of Simon, justifying his own share in the proceedings, and denouncing the work of the Bishop of Ventimiglia as "corruptam inquisitionem" (corrupting the inquiry). While the papal commissioner was taking the suspected actual murderer, one Enzelin, to Rome for trial, the Bishop of Trent and the podestà continued their proceedings against the Jews. Several of them were executed in December of 1475 and January of 1476. The Bishop of Ventimiglia reported to Rome that, as the result of careful investigations, he found the Jews innocent. He concluded that Simon had been killed by Christians with the intention of ruining the Jews, and that Bishop Hinderbach had planned to enrich himself by confiscating the estates of those executed. the Child Simon by Jews. According to the account given in the Jewish Encyclopedia, Sixtus IV appointed a commission of six cardinals to investigate the two proceedings. The head of the commission was an intimate friend of Bernardinus of Feltre. The result was a foregone conclusion, especially since the whole Catholic Church would have been involved in the condemnation of the Bishop of Trent if the commission had found against him. In the decree or Bull of June 20, 1478, "Facit nos pietas," Sixtus IV declared the proceedings against the Jews in Trent to be "rite et recte factum," endorsing the verdict. However, most of the decree cautioned against persecuting other Jews on account of the Trent proceedings. The Jews were all killed or baptized or fled Trent, and an interdict (cherem) was put on the city. The papal decree ordered that the property of Jews who had been killed be restored to their baptized widows. The issue of canonization is important because following the suppression of the cult, it was claimed that Simon of Trent along with Andreas of Rinn are both canonized saints. The actual status of both children is made clear in the Bull Beatus Andreas of Pope Gregory XIV: Both children were beatified, but neither one was formally canonized. 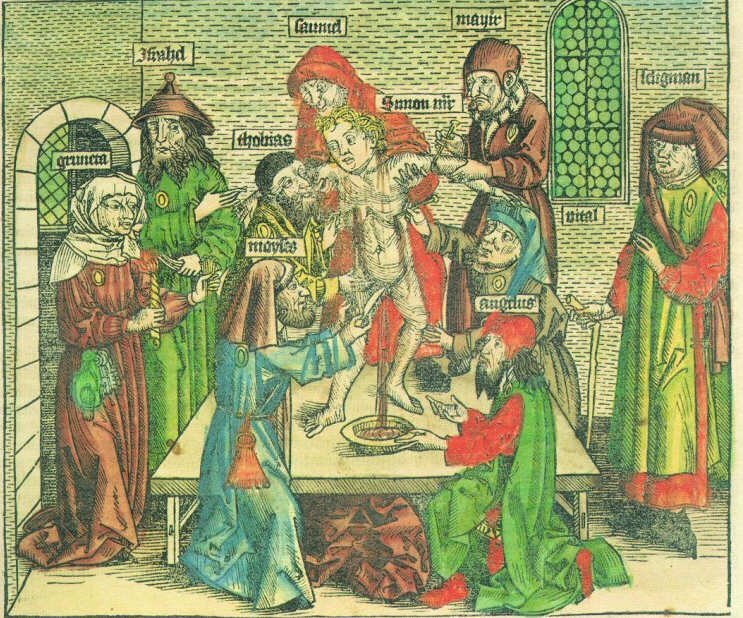 15th century woodcut showing Jews murdering the child Simon of Trent. In Hartmann Schedel, Nuremburg Chronicle or Buch der Chroniken, printed by Anton Koberger in 1493. The round yellow patches are badges that Jews were forced to wear. Names of protagonists like Thobias and Angelus are labeled. n 1965, following the Second Vatican Council, the Catholic Church began to reinvestigate the story of "little Simon" and opened the trial records anew. Finally declaring the episode a fraud, the cult of Simon was suppressed by Pope Paul VI and the shrine erected to Simon was dismantled. His feast day was removed from the calendar, and his future veneration was officially forbidden, Catholics who oppose the Vatican II reforms continue to venerate Simon and celebrate his feast day, March 24. Some "traditional" (anti-Semitic) Catholics ignore Vatican II and continue to celebrate the feast day of Simon of Trent. There are numerous cases of blood ritual reported in the past centuries. Many have been investigated by the Catholic Church and were confirmed, some by popes who had been unbelieving. Today, blood ritual is called a myth, an anti-semitic prosecution of days passed. To raise the ugly head of blood ritual is taboo. Yet, we are told many thousands of children disappear every year in the world. What has happened to them? Have there been any studies? An additional complication was added by the work of an Israeli Jew of Italian ancestry, Ariel Toaff, who published a book, The Blood of Passover (or Bloody Passovers), in which he alleged that a part of the blood libel story was true, or had a basis in fact. It is, honestly, hard to know what it is that he alleged, since his own story changed several times, and he denied an account given in a review, which claimed that he had verified the blood libel, and since the original book, published only in Italian, has been suppressed. 1- Ashkenasi Jews actually practiced murder of Christians to avenge forced conversions and murder of Jews. 2- The blood libel was brought about by rivalry between Sephardic Jews from Italy and Ashkenasi German Jews who competed with them in business. 3- The libel was in some way related to a merchant who had brought blood and sugar, supposedly for medicinal purposes, which was "precious" merchandise that the Jews were eager to have. 4- The ritual murders might have taken place. 5- He never said that the ritual murders might have taken place. In its present form, the book, like the author, is not very coherent. This may be due to clumsy editing. It is to be wondered why the medicinal blood (not necessarily human) and sugar merchandise of the "bearded Jew" merchant that he mentions was so precious, since blood of animals at least, was certainly as easy to come by in Italy as elsewhere. This is a very questionable statement. If the "components" appeared in Jewish prayer books, the books were open to the judges, and they could have certainly known them as the Church had Hebrew scholars and had examined at different times every aspect of Jewish law books and prayer books to determine if they insulted Christianity. The church also had a body of Jewish apostates who showed themselves quite eager to supply such background, whether it existed in fact or not, in order to satisfy the needs of church inquiries and produce the desired verdict.